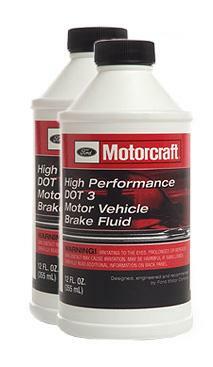 Genuine Motorcraft high performance brake fluid for hydraulic-actuated brake and clutch systems! Motorcraft PM1C Brake Fluid is the correct brake fluid for your Mustang or Lightning! It is also the fluid you'll need for the hydraulic clutch in your 2005-14 Mustang. This brake fluids minimum dry boiling point of (260°c / 500°F) exceeds the FMVSS 116 minimum requirement of (205°c / 401°F) & meets wet boiling point DOT 3 minimum requirements of (140°c / 284°F). Ford Motor Company Genuine Parts, Motorcraft® Parts and Ford and Motorcraft Remanufactured Parts are all excellent choices when it comes to performance, longevity and value for your Mustang or SVT Lightning. And they’re all backed by a Ford Motor Company limited parts warranty*, so you know their parts you use are going to perform like they should. Put the same parts on your Lighting & Mustang that came from the factory! Shop LatemodelRestoration.com for Motorcraft oil, oil filters, friction modifier, spark plugs, and many other replacement maintenance items!